There are a number of factors that seem to contribute to developing food allergies. Genetics seems to play an important role. One study found that that 64% of monozygotic twins had a concordance of peanut allergy, while only 7% dizygotic twins concorded. This means that in 64% of identical twin sets, either both had peanut allergies or neither did, while that was the case in only 7% of fraternal twins. Because monozygotic twins have identical genetic sequences, this finding implies a strong genetic component. HLA haplotyping has been studied, with conflicting reports on links between HLA type and allergies. One of the most important genetic findings regards filaggrin, a skin barrier protein. Patients with a specific filaggrin mutation are more likely to develop peanut sensitization. This indicates that a damaged skin barrier could cause food sensitization and allergy, and further supports the idea that non-oral exposures can be sensitizing. Additionally, filaggrin mutation causes increased inflammatory mediators in the skin. Generally, children with peanut or tree nut allergies react the first time the food is ingested. It is thought that they previously encountered these allergens in their environment. Household exposure to peanut was a significant risk factor for peanut allergy in infants. Peanut responsive T cells are found in the skin homing T cells in peanut allergic patients, implying that patients may first be exposed through the skin. There is not yet enough data on maternal ingestion of allergens to know if this is a risk factor. There are conflicting data sets on whether breastfeeding is protective against food allergies, and in any case, outcome appears to be dependent on the mother’s own sensitivity profile. Now seen in multiple recent studies, it seems that early oral exposure to food allergens may actually be protective against food allergy, a change from data produced over a decade ago. Immune dysregulation is obviously involved in food allergies. Low vitamin A and vitamin D, which modulate the immune system, have been noted as risk factors. Interestingly, food allergy frequency varies with latitude, indicating a further possible connection to sun exposure and vitamin D deficiency. High fat diet can also change the composition and behavior of the microbial content of the GI microbiome. Medium chain triglycerides can increase sensitization when given along with food antigens in mice. There are mixed results with long chain fatty acids. The changes in hygiene, cleaning products and use of antimicrobial compounds by the general public in the last decades have been implicated in many of the immune changes we have seen, including increasing autoimmune diseases and food allergies. This is known as the hygiene hypothesis, and it states that reduced exposure to microbes changes immune defense, causing improper reactivity to harmless components, like food and self cells. In food allergic mice, the gut microbiota has a very specific composition and transferring this flora set can actually make others more likely to develop food allergies. Dysbiosis has been noted in children with food allergies and a sequencing study demonstrated that food allergic children with atopic dermatitis have reduced microbial diversity in the gut. Cecilia Berin, Hugh A. Sampson. Food allergy: an enigmatic epidemic. Trends in Immunology, Volume 34, Issue 8, August 2013, pages 390-397. Cecilia Berin, Hugh A. Sampson. Mucosal Immunology of Food Allergy. Current Biology, Volume 23, Issue 9, May 2013, pages R389-R400. A single nucleotide polymorphism (SNP) is a change in DNA sequence in which one nucleotide (a DNA building block) is changed. Importantly, SNPs are common. In fact, they are so common that the way your body codes its DNA allows for SNPs to not change gene expression in many cases. This is called wobble. Three DNA building blocks in a row make one amino acid, which is used to build proteins that do things in the body. However, in many cases, the third building block can be any building block and it will still make the same amino acid. Please consider this. SNPs are so common that your cells know that in many cases, 1 in every 3 DNA building blocks can be anything and it won’t change a thing. SNPs have become the topic of increased interest, both by medical and scientific professions and by lay people. It is certainly true that some SNPs play a role in development and progression of diseases. MTHFR has been found to have up to 24 reported SNPs, with two being of particular interest. These are C677T and A1298C. Being homozygous for 677TT can cause a mild MTHFR deficiency because that this form of the enzyme is generally less stable, which means it breaks down faster than usual. People with this profile are also more likely to develop mild hyperhomocysteinemia, an elevation of homocysteine in the blood. Homocysteine is consumed in the metabolism of folate, and because there is less MTHFR with the 677TT mutation, the homocysteine is not all getting used. It is also elevated in cases of B6, B12 and folic acid deficiency. In the last six months or so, I have read about fifty scientific papers on MTHFR or related topics. I did this because I originally planned an MTHFR post for last summer. I didn’t do a post because the data is a mess. You cannot ascertain much of use from the peer reviewed literature on the C677T and A1298C mutations – and not for lack of effort. These mutations have been very well studied. MTHFR mutations and methylation are talked about a lot in the mast cell community. Many people believe that having an MTHFR mutation severely impacts folate metabolism, which in turn means there is not enough methylation, and this dysregulation causes overexpression of genes causing disease. I have searched thoroughly for a link. Really thoroughly. I cannot find any link that is not the idea of one person and researched by that one person, usually outside of peer reviewed settings. I cannot find any link that is not described in detail by a person who does not stand to gain financially from patients who share their beliefs. I am not saying that MTHFR is definitely not linked to mast cell disease. I’m saying I can’t find any proof that it is. I can’t even find anything that SUGGESTS that it is. Might people with these mutations feel better with appropriate folic acid supplementation? Probably. Is that the same thing as causing mast cell disease? Certainly not. It is certainly not the same thing. I think personal stories hold a lot of power. 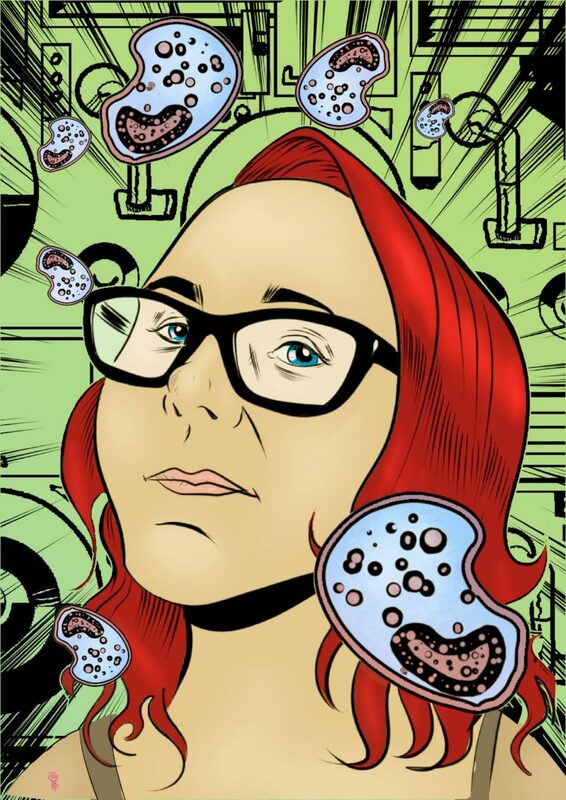 If your personal story is that your mast cell disease is significantly better controlled by addressing your MTHFR mutation, then I think that is fantastic. I think it is entirely possible that this is the case for many. But I do not believe it causes mast cell disease. And I think everyone would feel better with appropriate levels of folate, as it is an important player in many vital reactions. M L Slattery, et al. Methylenetetrahydrofolate reductase, diet and risk of colon cancer. Cancer Epidemiol Biomarkers Prev., 8 (1999), PP 560S-564S. House, AA; Eliasziw, M; Cattran, DC; Churchill, DN; Oliver, MJ; Fine, A; Dresser, GK; Spence, JD (Apr 28, 2010). “Effect of B-vitamin therapy on progression of diabetic nephropathy: a randomized controlled trial.”. JAMA: the Journal of the American Medical Association 303 (16): 1603–9. Skibola CF, Smith MT, Kane E, Roman E, Rollinson S, Cartwright RA, Morgan G’ (October 1999). “Polymorphisms in the methylenetetrahydrofolate reductase gene are associated with susceptibility to acute leukemia in adults”. Proc. Natl. Acad. Sci. U.S.A. 96 (22): 12810–5. Kim, Y I, et al. Methylenetetrahydrofolate reductase polymorphisms, folate and cancer risk: a paradigm of gene-nutrient interactions in carcinogenesis. Nutr Rev 58 (2000), pp 205-209. Xia, Lei-Zhou, et al. Methylenetetrahydrofolate reductase C677T and A1298C polymorphisms and gastric cancer susceptibility. World J Gastroenterol. Aug 28, 2014; 20(32): 11429–11438. What exactly is the D816V mutation and why does it matter? 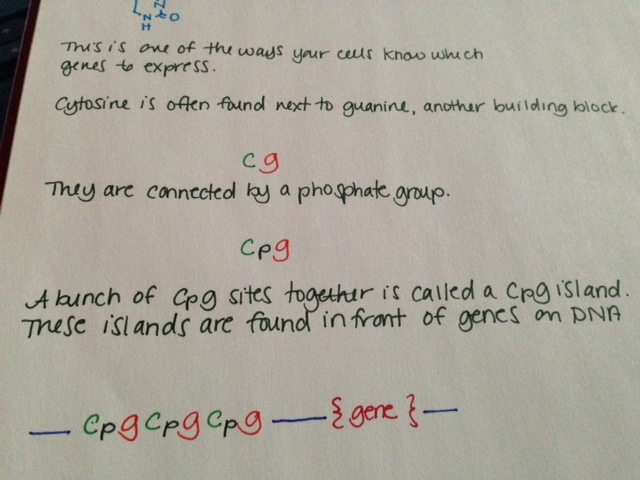 To answer that, we need to understand the basic pathway by which a cell expresses a gene. RNA (ribonucleic acid) is a more versatile nucleic acid that codes, regulates and expresses genes, amongst other things. 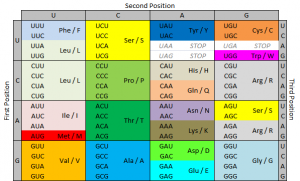 It also has base pairs: adenine and uracil (U), and thymine and cytosine. These nucleotides can be complementary to DNA nucleotides. For example, an RNA adenine is complementary to a DNA thymine, and so on. 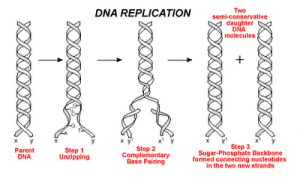 DNA replication is the process by which an exact copy of a piece of DNA is made. This happens when a cell divides. In replication, the DNA double helix “unzips,” or splits apart into two strands, the base pairs of which are not connected. Special enzymes move along each of the two split strands and place the appropriate nucleotides next to each strand to form base pairs. The end result of this is two double helices of DNA that are exact copies. Some parts of DNA, called genes, tell the cell how to make proteins or RNA that has a specific function. (Sometimes RNA can also do this.) Genes tell the cell how to build and maintain the cell and allow it pass on traits to offspring. These proteins or RNA are made by expressing the gene. In gene expression, the information from the gene is turned into a “gene product,” that will be made into something useful for the cell. 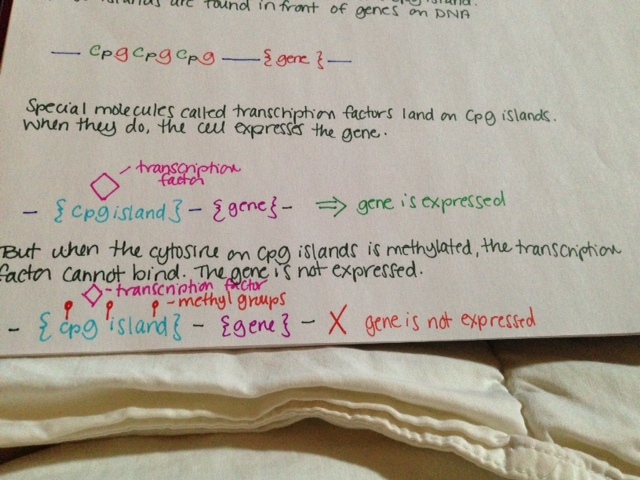 Transcription is the start of gene expression. Gene expression is very complicated and controlled by many mechanisms. Having a gene does not mean it will always be expressed. In transcription, a piece of DNA is copied into a complementary RNA strand. This RNA is called messenger RNA (mRNA.) This is a complicated process with several steps. Once a gene is translated, the mRNA with the gene code goes to the ribosome, a place in the cell that makes proteins. Proteins are made of amino acids. So how exactly does the DNA code for the protein the ribosome will make? Let’s focus on that. The ribosome reads the messenger RNA made from the DNA gene three nucleotides at a time. Again, when using the code to build a protein, the ribosome reads the code in blocks of three nucleotides. These blocks of three nucleotides are called “codons.” Every combination of three-nucleotides tells the ribosome to add a specific amino acid to the protein. The majority of genes are encoded using this same codon code. So by knowing the DNA sequence, we can anticipate the amino acids that build the protein encoded by the gene. There are several types of genetic mutations, or alterations of the code from the one seen in most of the population. In a point mutation, a single nucleotide is changed. The D816V mutation is a point mutation. We use a specific nomenclature to describe genetic mutations. Amino acids are often referred to with single letter codes for the sake of brevity. The amino acid aspartic acid is referred to as “D,” while the amino acid for valine is referred to as “V.” In the CKIT gene, the amino acid sequence Asp-Phe-Gly (aspartic acid – phenylalanine – glycine) is very important to the receptor being shaped the right way. Aspartic acid is encoded by the RNA code “GAU” or “GAC.” In cells with the D816V mutation, this sequence is changed to “GUU” or “GUC.” The second base is changed from an A to a U. 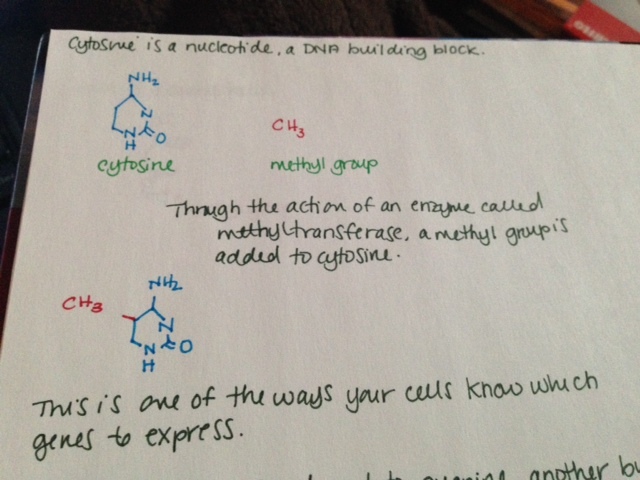 Doing this changes the amino acid encoded from aspartic acid (D) to valine (V). These amino acids are shaped differently, and because of this, the receptor is shaped differently and behaves differently. When the receptor is made with the amino acid aspartic acid in that place, SCF (stem cell factor) binds to the receptor and activates the cell, telling it not to die and to make more cells. When the receptor is made with the amino acid valine in that place, the receptor activates itself and SCF is not needed. It basically tells itself not to die and to make more cells repeatedly. So the term “D816V” means that at codon 816, the code was altered in a way that changed the amino acid for aspartic acid to valine. Some people with mast cell disease don’t have the D816V mutation, but often they have another mutation at codon 816, like D816G. Sometimes they have a mutation somewhere else in the same “exon.” An exon is the part of the code that is sent as RNA to be made into a gene product. The location of the CKIT gene is referred to as exon 17.